curl https://now-dns.com/ip If you have no need to use a secure (SSL) session or your environment does not support https you can also use http://now-dns.com/ip. At Now-DNS we've tried to make it as simple as possible to keep your DDNS domains up to date with your current IP address, whether it be IPv4 or IPv6. For Windows users we have two simple auto updating clients. Our Updater Client is run by thousands of users every day. The source code for the Updater Client is published on github here if you are interested. 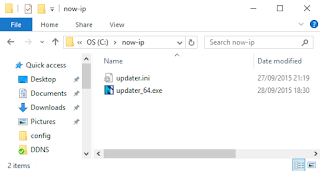 We also publish a simple Powershell updater script that can be scheduled to run periodically to check in and update your IP.